Astronomers have found what could be one of the universe's oldest stars, made almost entirely of materials spewed from the Big Bang. The star, named 2MASS J18082002–5104378 B, is part of a two-star system orbiting around a common point. Astronomers have found what could be one of the universe's oldest stars, a body almost entirely made of materials spewed from the Big Bang. The discovery of this approximately 13.5 billion-year-old tiny star means more stars with very low mass and very low metal content are likely out there -- perhaps even some of the universe's very first stars. The star is unusual because unlike other stars with very low metal content, it is part of the Milky Way's "thin disk" -- the part of the galaxy in which our own sun resides. 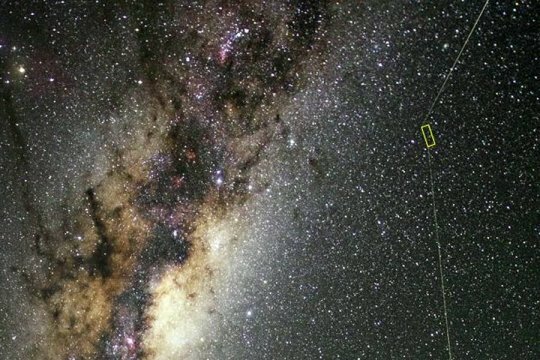 And because this star is so old, researchers say it's possible that our galactic neighborhood is at least 3 billion years older than previously thought. The findings are published in The Astrophysical Journal. "This star is maybe one in 10 million," said lead author Kevin Schlaufman, a Johns Hopkins University assistant professor of physics and astronomy. "It tells us something very important about the first generations of stars." The universe's first stars after the Big Bang would have consisted entirely of elements like hydrogen, helium, and small amounts of lithium. Those stars then produced elements heavier than helium in their cores and seeded the universe with them when they exploded as supernovae. The next generation of stars formed from clouds of material laced with those metals, incorporating them into their makeup. The metal content, or metallicity, of stars in the universe increased as the cycle of star birth and death continued. The newly discovered star's extremely low metallicity indicates that, in a cosmic family tree, it could be as little as one generation removed from the Big Bang. Indeed, it is the new record holder for the star with the smallest complement of heavy elements -- it has about the same heavy element content as the planet Mercury. In contrast, our sun is thousands of generations down that line and has a heavy element content equal to 14 Jupiters. Astronomers have found around 30 ancient "ultra metal-poor" stars with the approximate mass of the sun. The star Schlaufman and his team found, however, is only 14 percent the mass of the sun. The star is part of a two-star system orbiting around a common point. The team found the tiny, almost invisibly faint "secondary" star after another group of astronomers discovered the much brighter "primary" star. That team measured the primary's composition by studying a high-resolution optical spectrum of its light. The presence or absence of dark lines in a star's spectrum can identify the elements it contains, such as carbon, oxygen, hydrogen, iron, and more. In this case, the star had extremely low metallicity. Those astronomers also identified unusual behavior in the star system that implied the presence of a neutron star or black hole. Schlaufman and his team found that to be incorrect, but in doing so, they discovered the visible star's much smaller companion. The existence of the smaller companion star turned out to be the big discovery. Schlaufman's team was able to infer its mass by studying the primary star's slight "wobble" as the little star's gravity tugged at it. As recently as the late 1990s, researchers believed that only massive stars could have formed in the earliest stages of the universe -- and that they could never be observed because they burn through their fuel and die so quickly. But as astronomical simulations became more sophisticated, they began to hint that in certain situations, a star from this time period with particularly low mass could still exist, even more than 13 billion years since the Big Bang. Unlike huge stars, low-mass ones can live for exceedingly long times. Red dwarf stars, for instance, with a fraction of the mass of the sun, are thought to live to trillions of years. The discovery of this new ultra metal-poor star, named 2MASS J18082002-5104378 B, opens up the possibility of observing even older stars. "If our inference is correct, then low-mass stars that have a composition exclusively the outcome of the Big Bang can exist," said Schlaufman, who is also affiliated with the university's Institute for Data Intensive Engineering and Science. "Even though we have not yet found an object like that in our galaxy, it can exist."